With salted caramel sauce!! 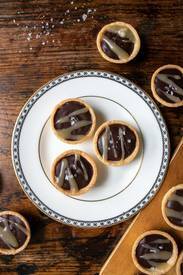 These mini dark chocolate tarts from Veggie Desserts are rich and delicious. The salted caramel sauce only takes 10 minutes to make, but gives them a lovely extra flavor dimension. Perfect for a party, dessert or afternoon tea.